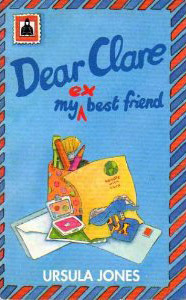 I wrote Dear Clare before everyone had a computer or mobile so the 13 year-old author of the letters, Anna, is a real, up to the minute, 1980's girl. A great deal is just about to happen to Anna. Over the next few months, she will fall in love, move to the country, become a vegetarian and a hunt saboteur (nearly), acquire a new grandmother, a hamster and a chicken, fall in love again, get a job, and learn to kiss. All this while keeping up a lively correspondence with numerous world leaders about the environment, and with her best friend, Clare, newly emigrated to Australia, to tell her all about it. "Anna Pitts, aged 13 going on 113, is a feisty commentator on life in an off-the-wall, one-parent, muesli, macramé and madness family. Funny, wry and all too probable, her letters make Adrian Mole look like Violet Elizabeth Bott."